Copeland Gin wins business in Estonia | Food NI - Our Food So Good! Copeland, the Saintfield-based producer of fresh fruit-infused gins has won its first business in Estonia. The company, which sources fresh fruit such as raspberries, blueberries and blackberries from farmers in Killinchy and other parts of Co Down, has signed a distribution deal in Tallinin, the Estonian capital, for its small batch gins. 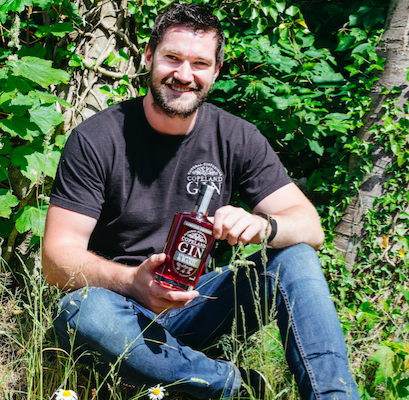 Copeland Gin, founded in 2016 by 25-year old Gareth Irvine, from Bangor, has begun shipping its rhuberry gin, which is made with rhubarb and blackberries, raspberry and mint gin and a limited edition spiced apple and blackcurrants to Actimer Ou in Tallinin. The deal in Estonia came by way of Dublin, according to Mr Irvine. He explains: “Actimer’s managing director was in the Republic last year and saw one of our gins in a bar in Dublin. He tried it, loved the distinctive fruity flavour and subsequently decided to give us a call. “I was absolutely thrilled when he called about doing business with us. This led to a distribution deal at the end of the year. The first consignment was shipped to Tallinin a few weeks ago,” he continues. “Initial feedback from the first bars to receive the gins has been immensely positive and hugely encouraging. We are looking forward to repeat business soon,” he adds. The Saintfield company will be running a programme of tastings at bars and hotels in the Estonian capital and other cities later in the month. “We’re really looking forward to showcasing the gins there and demonstrating how we process these from the freshest fruit grown by our farm suppliers in the Killinchy area,” he adds. He sees Estonian as a strategically important market that positioned close to Finland, Sweden, Latvia and Russia. “Our new distributor has contacts in many of these markets which we aim to develop in the year ahead,” he continues. The company, he adds, enjoyed business growth of 120 percent last year and is poised for even faster in the year ahead. The company, which has been assisted by Invest Northern Ireland and taken part in a range of marketing initiatives with the agency, has won listings with major retailers such as Tesco, Marks and Spencer, Sainsbury, Aldi, Lidl and Musgrave Group, is also shipping its gins to Britain and the United Arab Emirates.